Firstly, I wish I had a better title for this one – but I don’t. I struggled. I toyed with some juicy superlatives but then I felt like I was writing a cheesy tourism brochure. So I abandoned the challenge of decent title in favour of finding a good analogy. Unfortunately the best analogy I’ve come up with is crude and not remotely appropriate when trying to convey just how beautiful a place it is, but I’m going to run with it: the Grand Canyon is kind of like an autopsy. It’s like the world has been dissected and left on the table for all to see. The Earth’s history lie exposed, with eras and epochs evident in the Canyon’s multicoloured layers. You look at it and your mind starts blowing gaskets all over the place because this enormous, beautiful void was here for millions of years before there was even anyone around to look upon it. And you feel as small as one of the tiny, frenetic squirrels that live on its edge. Probably smaller. Definitely slower. The good (or bad) news is that you’ll undoubtedly be brought back to tangible human reality by one or more of the many other (less appreciative/cerebral) tourists hanging about, who seem less troubled by Grand-Canyon-induced existential angst and more concerned about whether the NPS café will be able to do them a non-fat-decaf-double-shot latte with their eggs-sausage- bacon-hash-browns-on-fried-bread breakfast. Oh, and where’s the ice machine? Travel teaches you interesting things about human nature. But back to the Canyon. It’s a damn tricksy thing to photograph. Try in the early morning and you end up with bright morning light saturating one half of your image and shadow dominating the rest; the canyon is so wide and so deep that the only time it is illuminated in its entirety is smack-bang in the middle of the day, when glare takes over as your biggest problem. The shadows can give you nice contrast, but I did find it difficult to get the balance right. 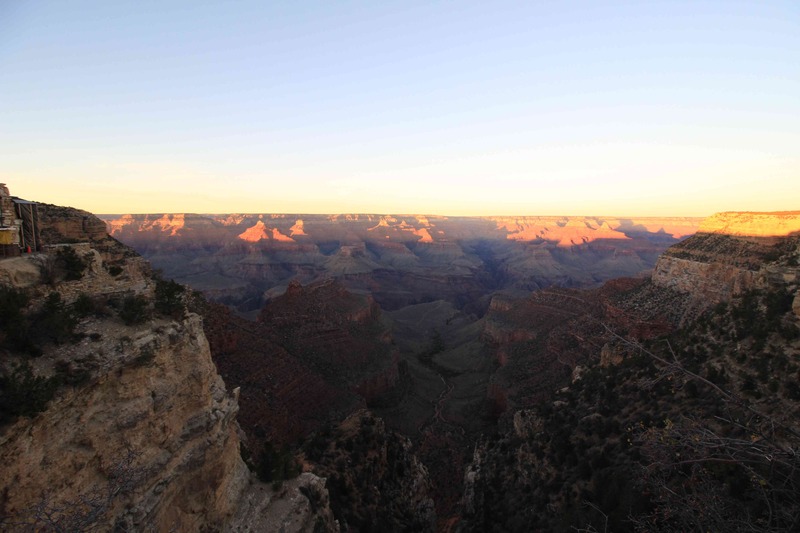 The colours, light and look of the Canyon are constantly shifting, often in seconds. It’s unfathomable in its vastness and easily one of the most incredible things I’ve ever seen, but I had to reconcile myself to the fact that a simple photograph will never quite do it justice – its magnificence eludes capture. Even the naked eye has a hard time processing the proportions. A number of times I stood looking out over the rim, just trying to digest it; I’m pretty sure I looked like Jacqui Lambie contemplating a quantum physics equation. Thus you walk away from the Canyon a little bit sad, knowing you’ll never be able to recall the enormity of it with perfect clarity or describe it adequately. In that regard it’s kind of like a great dream that you can’t remember the exact details of when you wake up – but you remember the way it made you feel. A trip to the Grand Canyon wouldn’t be complete without some hiking. Some people stick to the trails around the rim, which offer lots of great views from different angles, but we wanted to head down into the canyon itself (well – at least part of the way) via the Bright Angel trail. The full trail descends 13km down to through the bottom of the canyon, where you can stay at a small overnighter called Phantom Ranch. They urge people not to attempt the descent and ascent of Bright Angel all in one day – apparently people have died of stupidity exhaustion trying, and after walking just part of the way down I understand why. The descent is deceptively easy, although the trail is scary-steep in parts and the gravel can be slippery. Given my lifelong dedication to tumbling head over arse, I keep on the inside and take it slow. Along the way we pass other hikers on their way back up. They don’t say much other than a croaky ‘hello’, presumably because they’re trying not to throw up their hearts – which are currently doing the Temple-of-Doom thump in their chests. We make it down to the 3-mile rest stop in about an hour and a half (including lots of photo stops), and neither of us is particularly tired. We pause briefly to use the restrooms (not so much a toilet – more a toilet seat poised over a black, echoing abyss) and drink some water. 5 minutes into our ascent, I’m bounding up the switchbacks, bragging to Brendan: ‘Look at me! I’m like a mountain goat!’. He manages to swallow any number of possible retorts to this statement. 5 minutes later our hearts are pounding in our throats, but we’re still going at a good clip. I somehow walk faster uphill than I do down, probably because my legs figure the faster they get me over the hard bit, the sooner they/I get to eat a burger. We get around the last bend. It isn’t the last bend. We’re about halfway. By the time we get to the actual top, I’m no longer like a mountain goat. At most I’m like a drunk mule (side note: when you’re walking up or down the Canyon, you actually have to give way to real mules. They use them to carry people and packs down to the bottom). Our legs, thighs, bums and chests are burning – but we’ve managed to climb three miles up the side of the Grand Canyon. That’s a burger earned. You are much gamer than we were a month or so ago. We did the helicopter trip the year before and found it just as stupendous. It really does defy belief when you look at it, doesn’t it?